A petticoat is basically a wedding requirement which improves the appearance of the bride on her BIG DAY. It is unfortunate that a good number of brides neglect it. A pleasing petticoat indeed adds to the elegance and complete appearance of the gown. Moreover, a royal and classy wedding dress can result from a good petticoat. A petticoat functionally gives the impression of a slender waist by adjusting and holding the wedding dress out in an admirable domed shape. Different petticoats are employed to present different impressions. Our customers often face the challenge of selecting appropriate petticoats to match their wedding dresses. This article gives hints on how to select a petticoat for a wedding. 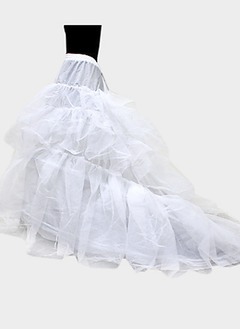 The varieties of petticoats in supply include two hoops, three hoops, A-line, three hoops train, two hoops mermaid, four hoops, six hoops, natural puffy, six hoops petticoat with net, slim mermaid and two hoops train. 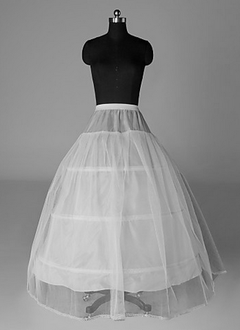 The naturally shaped and the petticoat with hoops are the most common types of petticoats. Nylon is the material that is generally used to make the normally shaped wedding petticoat. 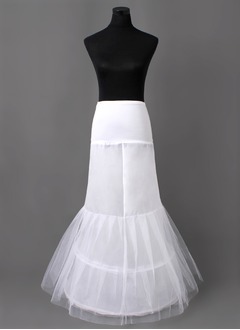 The normally shaped petticoat is more suitable than the petticoat with hoops for the tulle organza made wedding dress. Because of the light weight of the material, there is no need of more energy to hold it. The normally shaped petticoat gives a better domed silhouette. The following are the kinds of wedding dresses that are used with the petticoats with hoops: satin princess gown, gowns with chapel train or royal train, ball gown wedding dress and the gowns with ruffled hemline. 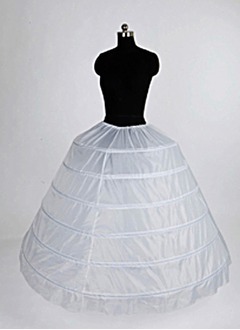 This type of petticoats mostly have two or three hoops with some having trains while some having tulle. The length of the dress and the silhouette of the gown determine the number of hoops. 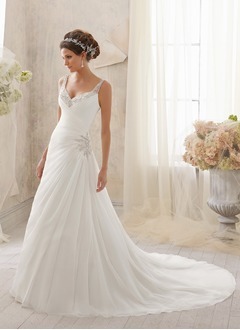 The wedding dress with chapel or royal train is best with the petticoat with train. The petticoat with hoops is not suitable for the gown made with satin since it makes the gown appear like the A-line style. This is because satin, being a very heavy material, can be held with hoops alone. 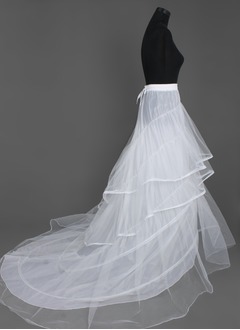 Provided that the satin material is not intensely thick, then there are two factors of importance to be considered when choosing the petticoat, namely the petticoat must be a tulle petticoat and must have hoops. An increase number of layers of tulle is desirable since it will do away with the shape of the hoops that shows up in the dress. 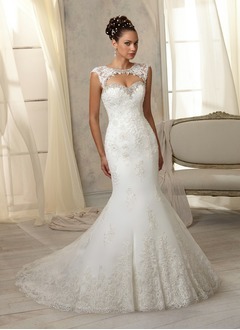 The bone petticoat is preferred if the wedding dress is of court train or chapel train style or even the tiered style. This is because the bone petticoat creates a gorgeous and perfect style by making the wedding dress more complete and thus portraying a royal vision. The shape of the dress and train are severely affected if the naturally shaped petticoat is used. The weight of the train causes the petticoat to deform. Gowns with ruffled or crinkled skirt: This sort of gown portrays the impression of slimness and draws people's focus to the waist. A contrasting scenario yields when dresses in completely domed shapes are used. It is because they can better deliver the effects of the creases. 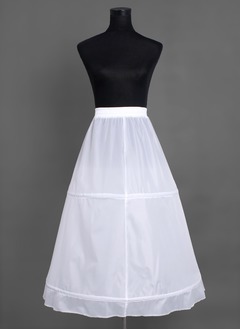 A-line petticoat suits the wedding dress with tight waist part and puffy skirt. Two hoops petticoat suit small A-line dresses. Three hoops petticoat suits A-line dresses not very puffy. Train petticoat suits A-line dresses with a small train. Two hoops mermaid petticoat suits dresses with slim body and a small train. Six hoops petticoat suits a ball gown. One hoop narrow mermaid petticoat suits a slim mermaid dress. A two hoops train petticoat suits an A line dress with middle length train. 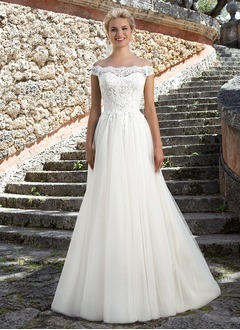 Ensure you truly require a petticoat to wear with your wedding dress. This is because most wedding dresses have sewn-in petticoats, thus there is no need of a separate underskirt. If there is a need for an additional skirt, then one can wear another petticoat to make the gown look puffier or fuller. Picking the petticoat is dictated by the dress design and style. For example the princess-shape wedding dress matches with a petticoat that makes the skirt look big enough to show off the A-line of the dress. Online purchases provide a wider selections and better deals. This is because online purchases enable one to do price and design comparisons from different shops online. Finally, we sincerely wish each bridal can find a perfect match petticoat with dress from Co.